This sequel to Star Wars Battlefront improves upon its predecessor with a variety of gameplay enhancements, such as upgraded AI, more than 16 new battlegrounds, and greater story emphasis. In addition to the rebel, clone, and droid warriors from the original game, you can play as a Jedi, complete with lightsaber attacks and force powers. Enjoy an all-new single-player experience that takes players through an epic, story-based saga centering on Darth Vader's elite 501st Legion of Stormtroopers where every action the player takes impacts the battlefront and, ultimately, the fate of the Star Wars galaxy. Game is super fun and brings me back to my childhood. Game was in perfect condition. One of the best games on ps2! Loads of content and it's all fun to play. A great alternative for those disappointed with the 2015 reboot. Game was also in near perfect condition; there was just some slight damage on manual and case. This is hands down the best start wars game out there. Keeps us playing for hours. Got great service and fast shipping from lukie games. Wouldn't buy from anywhere else. absolutely loving the space battles in this one. with so many options for warfare its getting a five star rating. i loved it i played at a friends house once and had to get i, and now that i did i play it as much as i can. 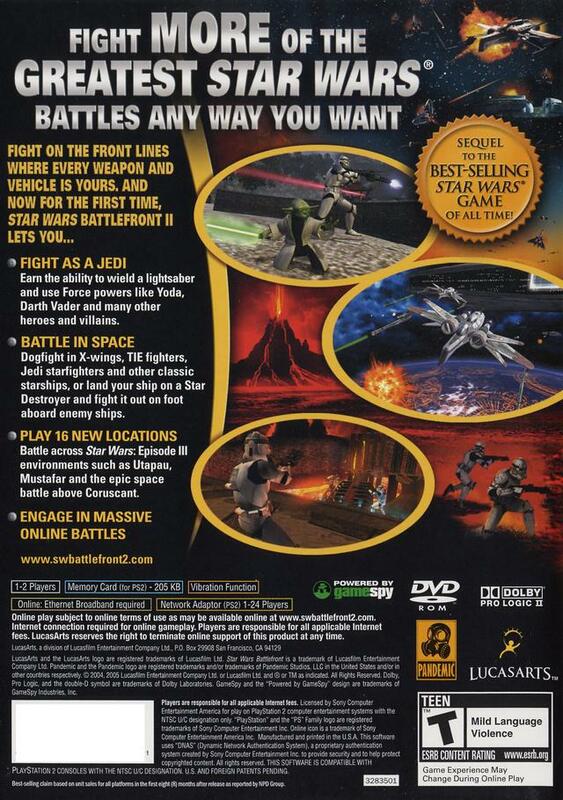 The very Best Star-Wars Battle Game on the PS2. This game is Great, It's the Perfect game if you're Looking for a Battlefield 2 type Star-Wars game, The Jedi Battles are Nice and you can Play Imperial, Rebel, Rebublic or CIS, all factions with thier According Jedis. There is a Stats and Awards System that Allows you to Upgrade your Rifles, Damage, Protector Force Shields, and Other Great Upgrades. (After Earning enough Medals). The Space Battles are Great, and its Perfect For Arial Combat set in Star Wars Galaxies. You Can Blast them out with Bombers or Fighters, or Special Attack Ships, and Use Proton Cannons and Proton Bombs, along with your Laser Cannons. 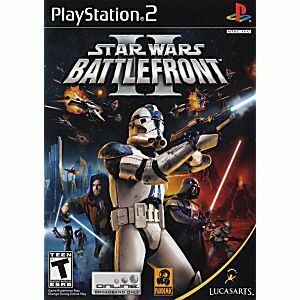 Overall, Im giving this 5 Stars, It is the Very Best Star-Wars Battle Game on the PS2. If your Looking for Something more Jedi-Oriented, I'd Go with Star Wars Episode III : Revenge of the Sith. Awesome Game! Battlefront 2 is 3rd person shooter, and my favorite at that. The campaign takes you through the entire star wars series, all though the perspective of one of the clone soldiers. You can play as Anakin slaughtering the Jedi, and as Darth Vader assaulting Hoth. The missions are an excellent mix of various objectives, and the challenge level is just enough to keep you from slacking off. The game comes with other modes as well, including "galactic conquest," where you command the fleets of either the CIS, the Clones, the Empire, or the Rebellion, in an attempt to take over the galaxy one system at a time. The instant action mode allows you to play against AI on any map with customizable settings, or against other players online or in split screen. Playing as a hero is loads of fun, there's nothing quite as satisfying as slicing through entire armies with a light saber. Unfortunately most of the non-jedi hero's are pretty useless, but that bit is just my opinion. The combat is wild and fast paced, despite the fact that players can take many hits before going down. If you own a playstation 2, you should already own this game. If not, pick it up! 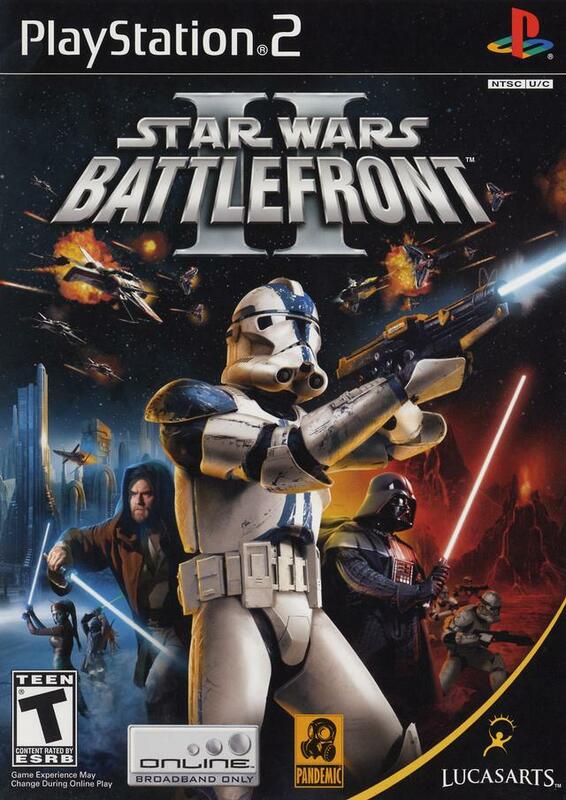 A great game with even more to offer than the first Battlefront, which was great in its own right. There are new worlds to battle on and you can also have starfighter battles. Another cool feature is that you can now play as heroes, such as various Jedi and Sith. The campaign mode is pretty fun as well. The only thing that bothers me is that you can only fight clones against droid army and rebels again the empire. It would have been sweet if you could switch it up a little bit.